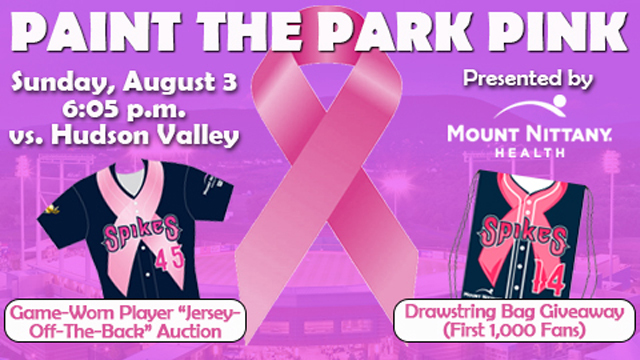 Join the Spikes and Mount Nittany Health to raise funds and awareness for the fight against breast cancer at the annual Paint the Park Pink Night on Sunday, August 3rd! Game time for the Spikes’ matchup against the Hudson Valley Renegades (Tampa Bay Rays) is set for 6:05 p.m. The Spikes will wear special Pink Ribbon Jerseys for the event, which will be up for bids in a Jersey-off-the-Back Auction to benefit the Breast Care Center at Mount Nittany Medical Center through The Foundation at Mount Nittany Medical Center. The silent auction will begin when ballpark gates open (4:45 p.m. season ticket holders; 5 p.m. general public) and will continue through the conclusion of the sixth inning. The fan with the highest bid on each Spikes player or coach jersey will receive his or her jersey directly from the player or coach as part of a special on-field ceremony after the game. In addition, the first 1,000 fans of all ages through the gates will receive a Pink Ribbon Drawstring Bag, presented by Mount Nittany Health. After the game, fans will enjoy a fantastic post-game FIREWORKS display, presented by Mount Nittany Health and WHVL-TV that will light up the skies over Central PA! The Spikes are also partnering with Pink Zone at Penn State and the Penn State Lady Lions to promote the battle against breast cancer on Sunday. Lady Lions head coach Coquese Washington will throw out a ceremonial first pitch as part of the evening’s activities, and members of the Lady Lions will sign autographs during the night. This article originally appeared on the official website of the State College Spikes. Click here to view the original story.